Rumours of some summery weather on the way. More about that shortly, but what’s coming up in the next 4 days? Thursday won’t be too bad overall but as well as sunny spells some showers are expected. A brisk cool westerly wind though and disappointing temperatures. Max 13°C. On to Friday and it’s particularly unsettled. Low pressure to our northwest is in charge. Frequent showers during the day with some hail or thunder likely. Hopefully these showers ease off later in the day. Windy and cool once again. Max 12°C. The weekend is split with Saturday your best day. We start the weekend with a ridge of high pressure nudging in from the southwest so a settled day with some sunny spells. Pleasant in the sun and a dry day but still temperatures below average. Max 14°C. The gardens will enjoy some more rain on Sunday. A wet morning with rain at times from the west. Later on, it will be more of a showery theme and remaining cool. Not a great day with another low pressure influencing. Max 13°C. Looking ahead it remains unsettled with further spells of rain or showers and cool. However, at the moment, it looks like later next week high pressure builds from the south and as well as some drier weather with sunny spells, the temperatures should begin to rise. I’m hoping we see some into the 20s. In the current time-frame there’s still a chance for it to change. As always, keep in touch with @ChadWeather on Twitter for your local weather updates. Halfway through May and no sign of an early summer. Quite the opposite as next week looks cool and showery as well as breezy. Thursday was looking wet but with rain swinging across southern England rather than northern England it looks like we will miss it and just have a dry day with bright spells. Max 12°C. As we enter Friday the low pressure to the south moves away and a brief ridge of high pressure arrives. A settled day with bright spells but cloudier later with light rain overnight. Max 14°C. The weekend looks better on Saturday when we can expect bright or sunny spells but still temperatures disappointing for the time of year. It should though remain dry. Max 14°C. Sunday sees a change as winds increase. Any bright spells in the morning being replaced by cloudier conditions into the afternoon and showery rain becomes a risk. Feeling cool. Max 13°C. Follow @ChadWeather on Twitter for a personalised local forecast and also @OldhamWxStats for live conditions in Oldham tweeted every hour. We are firmly in May now but the weather continues to misbehave. 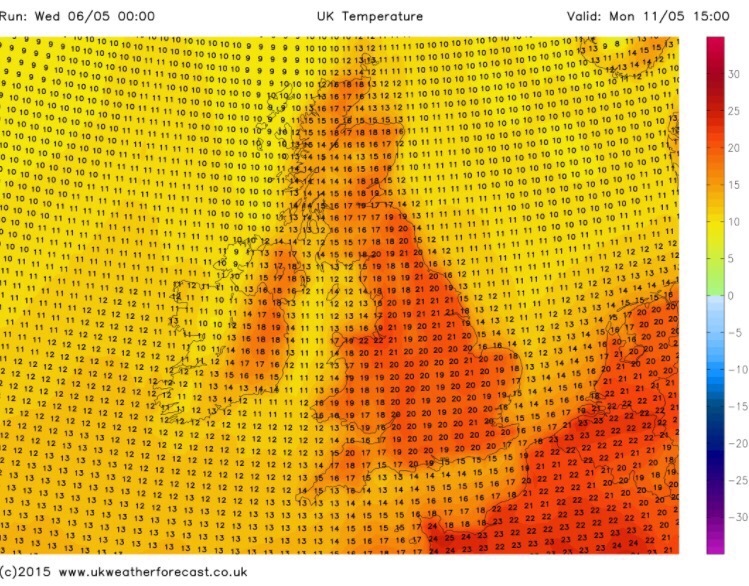 Only bit of good news is something warmer early next week. Thursday will be an improvement from recent days. Sunny spells and some scattered showers especially early on. Windy early on but easing all the time throughout the day. As long as the showers don’t hang on, brighter skies later in the afternoon. Still cool for the time of year. Max 12°C. Friday promises to be a generally dry morning for most. Lighter winds and bright spells. Temperatures a little higher. Cloudier later in the day with rain into the evening or perhaps late-afternoon. Max 14°C. It’s the Manchester 10k on Sunday and it looks likely the better day of the weekend. Saturday will see overnight rain clear but to a day of sunshine and heavy showers. Possible thunder. Max 13°C. A ridge of high pressure builds in on Sunday, killing off the showers and giving us a bright day and feeling warmer especially in any sunshine. Max 16°C. So not bad for the 10k and all the spectators, including me! Next week we drag in some warmer air from the south so temperatures could briefly rise to 21°C before unsettled conditions return and with it, cooler conditions. Follow @ChadWeather on Twitter for all your local forecasts.